Webber took his first pole of the season, smashing his second to last lap time by over one second. “There is not too much to say, we waited too long in the garage and, together with others, we made a mistake which was paid highly,” read Ferrari on Twitter. That’s the problem with the top teams. At times they feel they can outsmart the rest by making decisions like that. When they back fire, it makes them look like amateurs. McLaren achieved nothing as half of Q1 ended. In addition, because of the strategy, they went out on intermediate tires and the track conditions were getting worse. As Button spun off-track attempting to improve on 12th place, he was buried in the gravel with his engine still running. What did they expect to happen? It was clear that Button was not going anywhere. In addition, any assistance from the marshals is not allowed. Just before the car was being pulled out, it sounded as though the McLaren garage had hopes of getting Button back on track – his 1:52:211 time put him through to Q2. Did they really think that Button could have his car toed out and still be eligible for Q2? Eh, no. Redbull, Mercedes, Force India, Williams and Renault, rounded up the teams with Kobayashi’s BMW taking 9th. 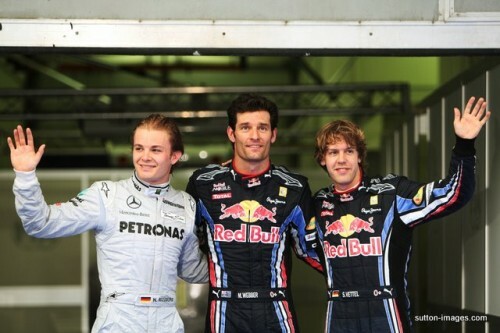 The top three qualifiers, Webber, Rosberg, and Vettel, are as expected. What I can’t figure out is Michael Schumacher’s pace. Back in the day, Schumacher was the king of the rain – the king of it all actually. Today, not so much. It was his final lap of the day and he barely managed 8th place with 1:51:717. Kobayashi in 9th place was only 0.50 behind. At the same time, Webber was on his flier – weather conditions seemed good enough for Michael to improve. Mercedes has put together a three year contract for Michael Schumacher and his comeback, one of the most anticipated comebacks ever. At $30 million, Michael does not come cheap. At the same time, Mercedes don’t expect cheap, which, in my opinion, is what they are getting at the moment. We can say he has been out of the car for three years and it takes time to adjust, but how long are we going to keep using that card? For reference, Rosberg, Schumacher’s teammate, clocked a 1:50:673. Considering the inconsistency of the Redbull chasis, I vote Rosberg for the win tomorrow. Be sure to keep your eyes at the back. Alonso, Massa and Hamilton will put on a great show as they attempt to claw back up.